On October 15, 2005, top-ranked USC traveled to South Bend to meet ninth-ranked Notre Dame. The game remains one of the most watched regular season games in recent years and received lots of hype including Notre Dame wearing green jerseys. Trailing by three points with two minutes left in the game, Leinart began a game-winning drive from the USC 20 yard line. The drive did not begin well as an incompletion was followed by a ten yard sack with 1:30 left to play. On fourth down from his own 21, Leinart called an audible and connected with Dwayne Jarrett along the left sideline, who caught the ball on the Irish 49 and ran all the way to the Notre Dame 13 yard line. Two Reggie Bush runs took the ball to the two-yard line. With 14 seconds left to play, Leinart rolled left and had the ball knocked out of bounds at the one stopping the clock at 0:01. The play caused great confusion as the clock incorrectly continued to run, causing hundreds of Notre Dame fans to spill out on to the field thinking the game was over. Now with seven seconds to play and no timeouts, USC coach Pete Carroll made a decoy signal for Leinart to down the ball to stop the clock. Instead the quarterback took the snap, went to his left and spun back- first over the goal line for the touchdown. 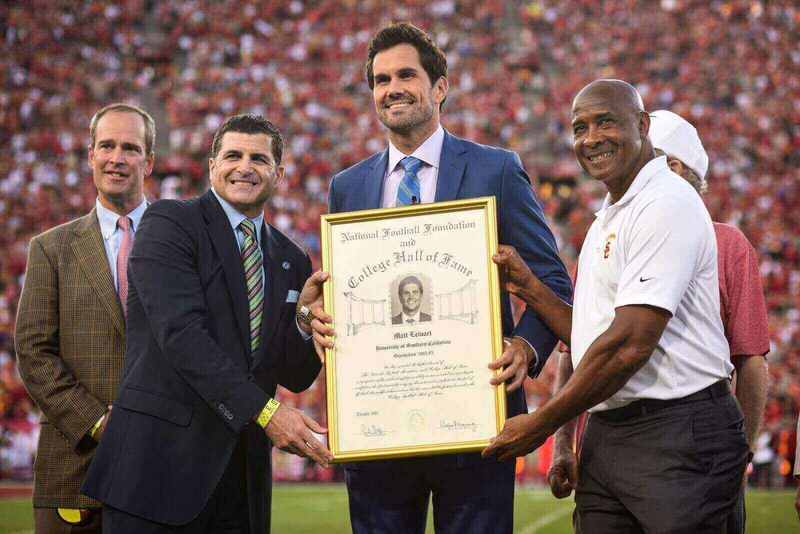 As he was struggling to score, Leinart was assisted by a push from Reggie Bush, solidifying the play as one for the USC football history books.